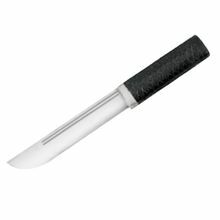 This harmless plastic knife is 9.5 inches long overall with a 5.375 inch blade and weighs about 4 oz. The soft material it is made from will not harm anyone and is perfect for takeaway self defense drills and other such training. However, this is not a toy and is intended for use by adults.